Lethal Judgment is a shoot’em up franchise created by a French indie team BGames Studios. The series already features several episodes of great quality, being easily compared to Project X, a classic game by Team 17 for the Commodore Amiga. Although available to purchase on Xbox 360, Lethal Judgment games are freely available for PC players and just can’t be missed! Lethal Judgment Origins is a free side-scrolling shooter for PC with HD graphics and some amazing special effects. 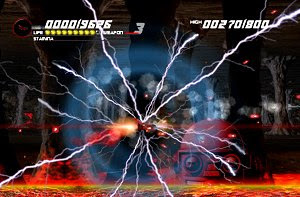 Gameplay is fast and furious with 60 frames per second, uncountable layers of parallax and lots of enemy waves to dispatch through five worlds. 15 specific challenges to conquer add some variety to the game. Lethal Judgment Origins is just one fantastic shoot’em up part of a long-running series with other quality games that will also be featured on FreePCGamers.